El Dorado Springs City Cemetery, Tuesday, October 29, 2013, 3:30 p.m. In lieu of flowers memorial donations may be made in Len's honor to LIFEToday.org. Len Wester Bland, 95, exchanged this life for eternal life October 24, 2013, at Village Hospice House in Lee’s Summit, Missouri. He was a resident of Raytown, Missouri for 59 years. Len was born February 11, 1918, in St. Clair County, Missouri, to the late Lafayette Washington and Mary Bland. He was one of nine children and grew up in Black Jack, Missouri. He was preceded in death by all of his siblings. In 1941, he moved to Kansas City and went to work for Frigidaire – later working at Richards Gebaur Air Base. In 1942 he married Helen Davis. She was the love of his life for 56 years, passing away in 1998. 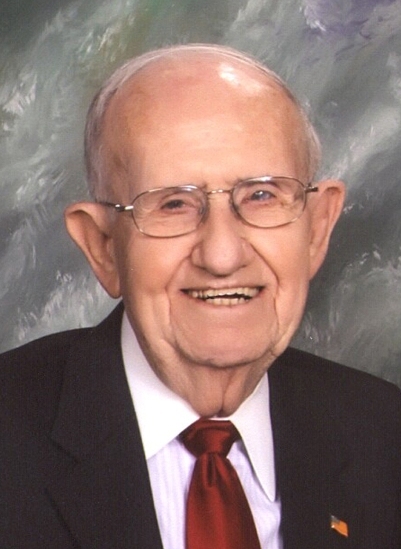 Len was a passionate follower of Christ and served on the local church board for over 50 years. He was Sunday School Superintendent for 49 years. Their home was a welcoming place to everyone and he and Helen were known for their gracious hospitality. Len and Helen were both very active in the Jackson County Rose Society as well as The Johnson County Rose Society – winning many prizes and awards for their roses. Many of Len’s roses have been featured on Hallmark Greeting Cards. He shared his love of roses with many people taking numerous arrangements to friends, family, shut-ins or just someone he felt needed a bit of encouragement. He never met a stranger and had friends too many to number. Everyone loved his cheerful, positive attitude and he never forgot a face or name! He was a unique individual. A host of family and friends are left to mourn his passing. Visitation will be at the Gregory Hills Church of God (Holiness), Tuesday, October 29, 2013 from 10 a.m. to 11 a.m. followed by a Celebration Service at 11 a.m. Rev. Ernest Mullins and Rev. William Cook will officiate. A graveside service will follow at the El Dorado Springs City Cemetery at 3:30 p.m. Arrangements are under the direction of Bland-Hackleman Funeral Home. Len’s heart was touched deeply by the little children in third world countries in need of clean drinking water as well as shoes. Memorials can be made in his honor to LIFEToday.org. Special thanks are extended to the wonderful, caring people at Village Hospice House and the nurses and caregivers who ministered to Len so kindly in his home over these last weeks.